Paw Paw's Campers and Cars is a family owned business that has operated in Picayune, MS, for the last 25 years. Dub "Paw Paw" Herring, founder and President, is still very much involved with the day to day operations. Over the last 25 years, Paw Paw has purchased thousands of RV's and autos from individuals just like you. Sometimes, even when customers purchase their new RV or Auto at other dealerships, they sell their trade in to Paw Paw's. Why? Because they know Paw Paw will give them a fair price on their Car, Truck, SUV, or RV. Why do so many people sell their units to Paw Paw? Well, the main reason is they simply trust Paw Paw and his staff. Another good reason to buy from Paw Paw's is to avoid scams or people who waste your valuable time! Don't let anyone waste your time or offer you a totally ridiculous price for your unit! Why burden yourself with the aggravation and expense of advertising your RV, having strangers stopping by your house, and transferring titles? Not to mention, when was the last time someone stopped by your house to buy an RV? At Paw Paw's, that's what we do. So leave selling your RV to us. We get results fast! How do I get started if I have something that I want to sell or leave on consignment? It is very simple. Just follow the instructions below. Please fill out and submit the RV Information Form below. We will contact you to set an appointment to bring your unit to Paw Paw's for an official appraisal. Once a selling price or a consignment price is agreed on, the proper paper work will be prepared and signed. Arrangements will be made to deliver or pick up unit. You will receive your check. 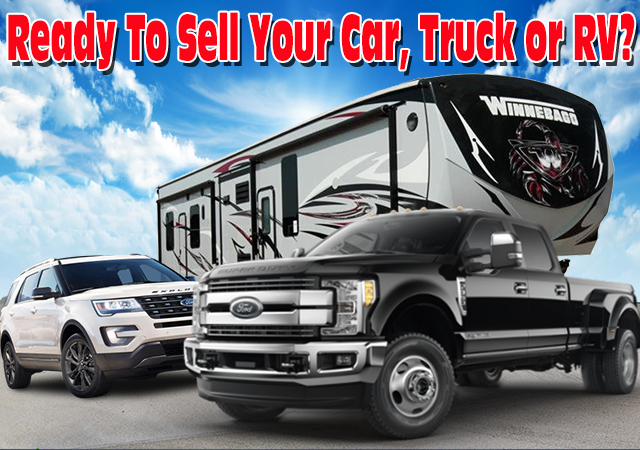 Paw Paw's Campers and Cars wants to Purchase or Consign your RV or Auto. Call us and let us get you a Check today!